Yay! 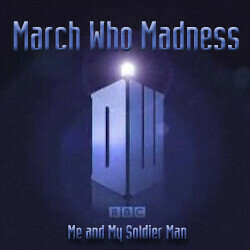 Today we are officially kicking off March Who Madness as we countdown the month of March to the Spring season premiere of Doctor Who! Are you excited? I know I am! Be sure and come back every day to see the topic of the day. And if you decide to join in the fun (at any point, you don’t have to start at the beginning) each day will have a linky you can use to let us see your posts. And don’t forget to add this snazzy button, designed by Amber! I know, I’m solidly in the minority, but my favorite Doctor is Nine. I feel like he was really the perfect way to reintroduce the series. The perfect mix of serious, zany and curious. The “mad man with a box” schtick wears on me after a while, and he had just the right touch of it without having too much. That’s Four, if you aren’t familiar with the original series. If you aren’t, Netflix FINALLY has some of them in the order in which they originally aired. I just finished watching them a few weeks ago. The Doctor was a different character back then, with a lot of the current Doctor’s story not yet written. And while all the previous Doctors were interesting to watch, they were either very serious or a little too arrogant or disconnected for me. Except for Four, who (as far as I could tell) began the “mad man with a box” style, slipping into sarcasm without warning and offering random aliens jelly beans. I definitely like Nine better than Eleven, but Ten is my favorite! I have not had a chance to watch all of the Classic episodes on Netflix yet. It is on my to-do list. What an awesome link up! I just started watching Doctor Who and started Season 4 last night. I really like the Ninth doctor more than the tenth! Glad I am not the only one! So, I've never seen any episode, new or old. In fact, I hadn't even heard of the show until very recently. Apparently, it is a BIG deal! Will you explain/review the series for your friend who clearly lives under a rock! ?